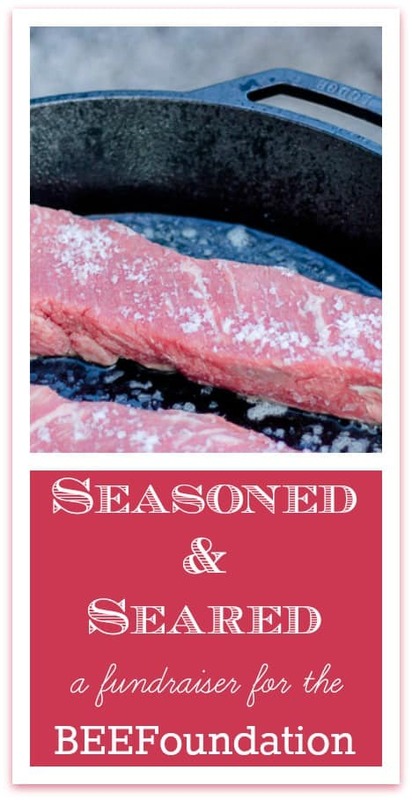 A few days ago, I had the honor to attend a special evening entitled Seasoned and Seared, that served as a fundraiser for the BEEFoundation. The BEEFoundation is a nonprofit organization that provides education and professional development opportunities for students (like the Future Farmers of America, and 4H groups), and beef producers. As times change, best practices in agriculture change as well, and beef producers need the opportunity to learn new techniques, and technologies. The BEEFoundation also educates consumers in regard to the importance of beef production in American agriculture. The BEEFoundation’s goal is to ensure farming’s legacy for future generations. The fundraiser was a delightfully unique culinary experience, featuring Certified Angus beef dishes from Nashville chefs, and was held in the Green Door Gourmet’s Grand Barn in Nashville. 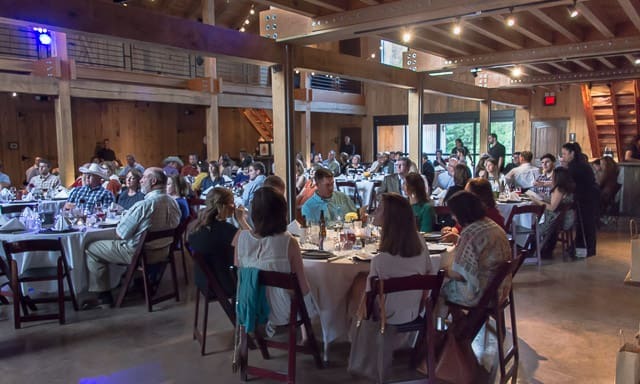 The dinner celebrated beef, one of TN’s top agricultural commodities. 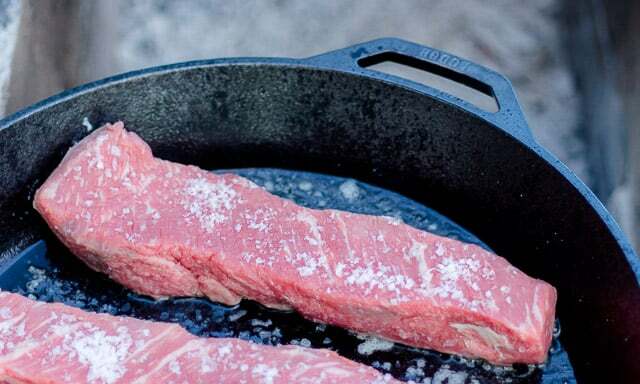 The BEEFoundation partnered with Lodge Cast Iron®, to host Season & Seared. 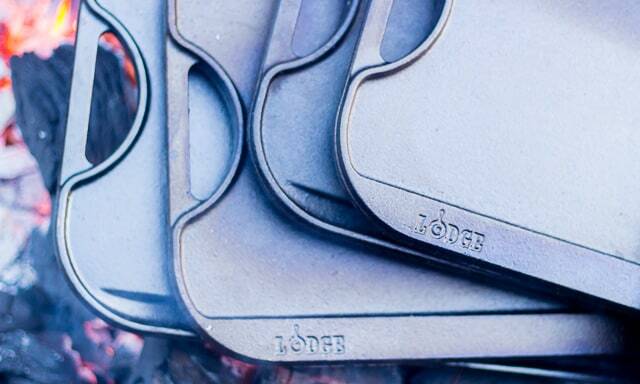 Lodge Cast Iron has been made in TN since 1896, and is known worldwide as the gold standard of seasoned cast iron. I thought I’d share with you some pics from the evening, starting outside the Grand Barn at Green Door Gourmet, where we had appetizers, and where the food for the evening was grilled, and then moving inside. Because that’s pretty much the way I experienced the evening. 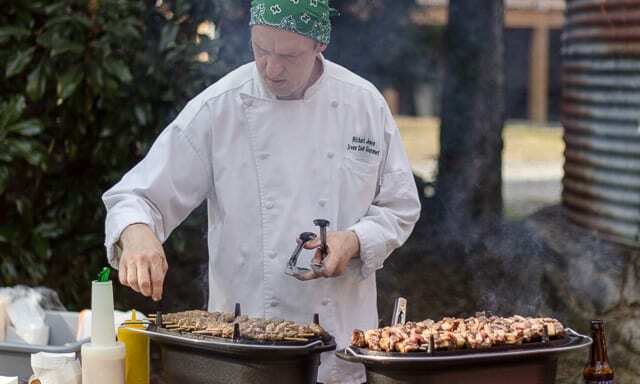 Chef Richard Jones of The Green Door Gourmet, grilling our appetizers. 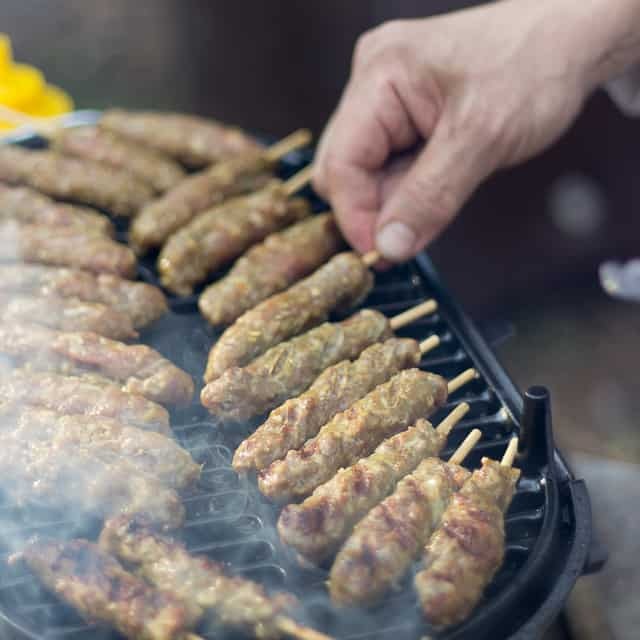 The Malaysian Beef Skewers being grilled on Lodge Cast Iron®’s Sportsman’s Grill. This is a closeup of our apps. 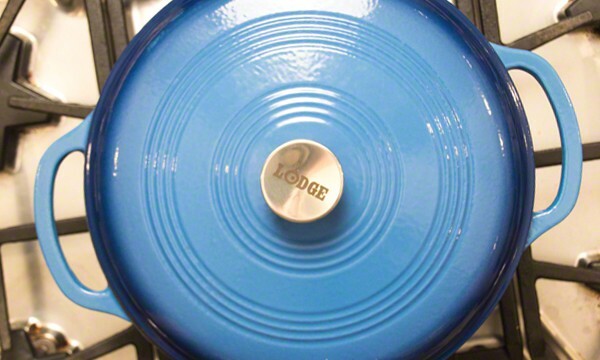 On a side note, I adore Lodge Cast Iron Cookware, personally. I use it on an almost a daily basis to create the recipes I cook for my family, and for this blog. I was thrilled to learn that not only is it a Tennessee business, but that it is also a business that is family-owned. The Lodge Cast Iron Griddles, heating up over the coals in the pit. Well known Nashville chefs Steven Chandler of Kayne Prime, Jay Mitchell of Tennessee Brew Works, Eric Zizka of Oak Steakhouse, Andrew Whitney of Virago, and Richard Jones of Green Door Gourmet were our chefs for the evening. 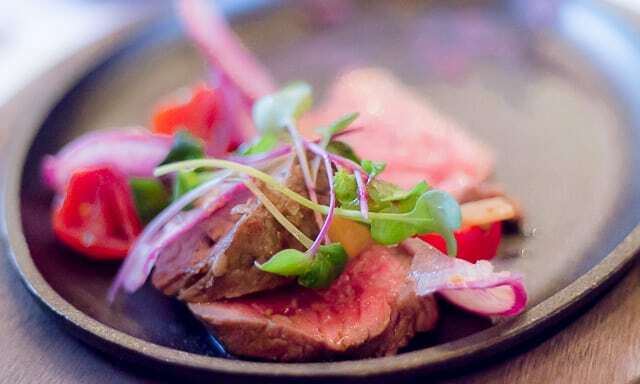 Each of the chefs used Certified Angus Beef® to create their dishes. Most of the chef’s creations were cooked in Lodge Skillets or on Lodge grill pans and platters, outdoors, over an open pit fire. The pit was constructed of cement blocks, just outside the barn. 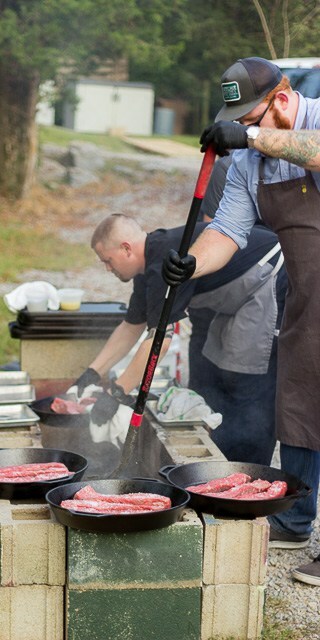 Chef Jones used Lodge’s Cast Iron Sportsman’s Grill to grill our appetizers. 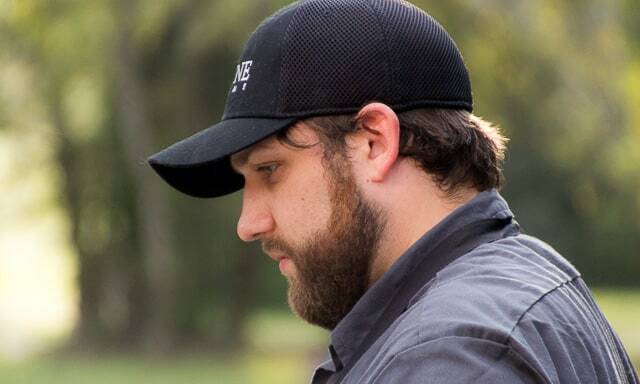 Chef Steven Chandler of Kayne Prime, at the tender age of 29, has had an impressive career! We joked that he could be “my son”. Thinking about playing that card at Kayne Prime on Mother’s Day. Chef Andrew Whitney’s dish would have won my vote for favorite dish of the evening. Don’t tell “my son”. The chefs in action over the pit. The Strip Loin, beautifully seasoned, being seared in the skillet over the pit. 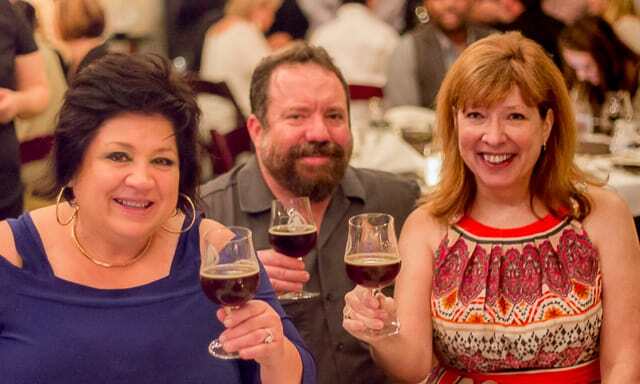 As the guests arrived at the Green Door Gourmet, we were treated to the beautiful appetizers, wines, and craft beers. The craft beers were all provided by Tennessee Brew Works. 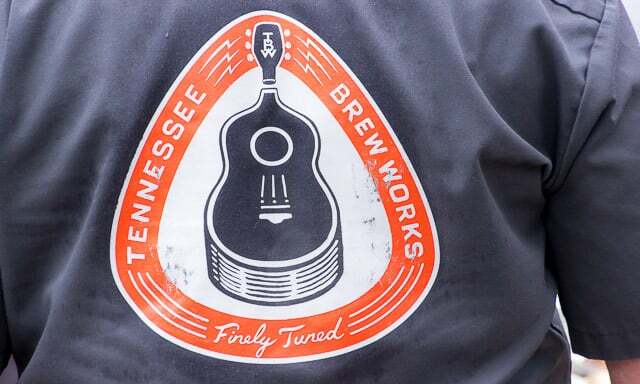 The Craft Beers were provided by Tennessee Brew Works. Each had been carefully chosen to pair perfectly with each course. This is the back of Matt Simpson’s shirt. Matt is a brewmaster at Tennessee Brew Works, and the beers he brewed and chose were WONDERFUL! Following the appetizers, the guests filtered into the dining room to enjoy the rest of the meal. 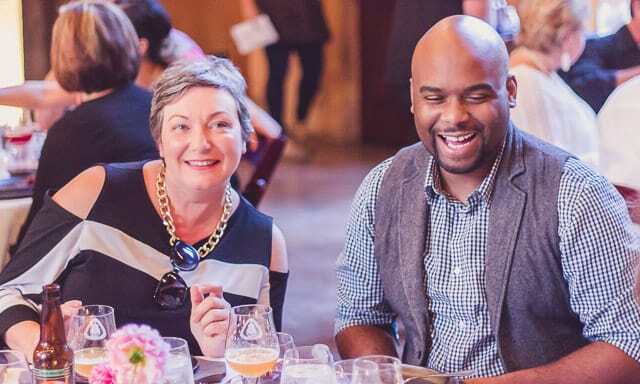 My friend Charles Hunter, of The Salted Table and private chef/caterer, and Didi, the publisher of Tennessee Craft Beer magazine. While I don’t have pictures of every dish, some were so outstandingly lovely that I had to show you a few. This was a salad with goat cheese, bone marrow, candy cane beets and regular beets. And I ACTUALLY ENJOYED BEETS!!! Who’da thunk that someone like me, who is not much of a beer drinker, would discover that when you pair a perfectly selected beer with an excellent dish, it can be as lovely as a wine pairing? 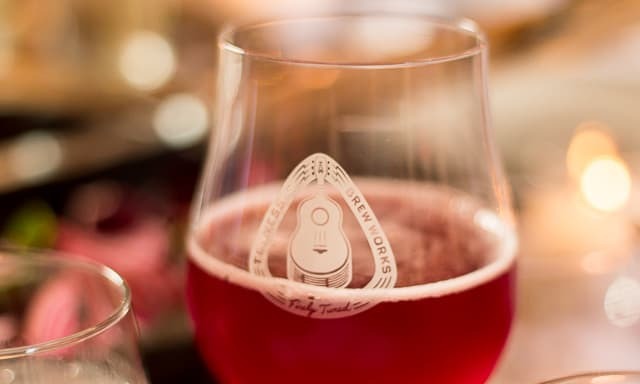 This is a Belgian Beet Ale, that was LOVELY to see AND taste, and it paired perfectly with the beet, bone marrow, candy cane radish and goat cheese salad. Absolutely amazing! This strip loin Tataki was my personal favorite dish of the evening. It was made by Chef Andrew of Virago. That Certified Angus Beef was SO tender and flavorful. To die for! 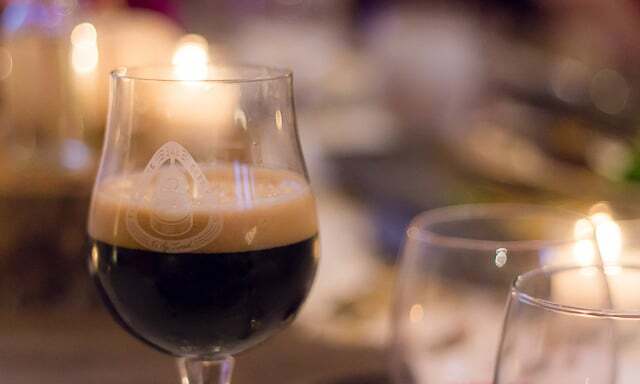 This was the American Style Stout that was a perfect pairing for that strip loin. 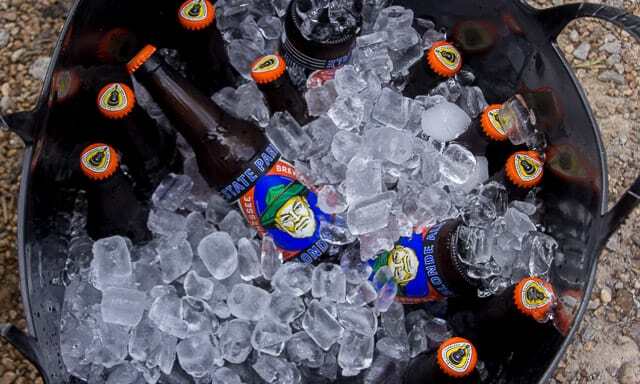 Believe it or not, it was brewed with sweet potatoes. Oh. My. Gosh. SOOOO GOOOOD! 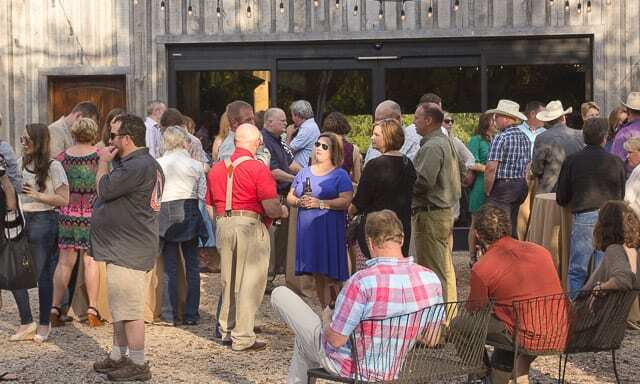 The fresh organic produce was provided by Green Door Gourmet, and the craft brews that were paired with each course were provided by Tennessee Brew Works. I want to give a huge shoutout of thanks to both of those fine facilities. They are SO worth seeking out! Left to right, Lisa Mays of My Paella Travels (paella chef extraordinaire, and she travels to YOU! Hire her for your next event!) Matt Simpson, the phenomenal brewmaster of Tennessee Brew Works, and moi, toasting an unbelievably wonderful meal! The auctioneer in action! Don’t scratch your nose, accidentally, while they’re doing their thing! Funds were raised following the meal through a silent auction, wherein many of the dinner guests both donated prizes, and bid on prizes themselves. The men running the auction were the real deal, too! 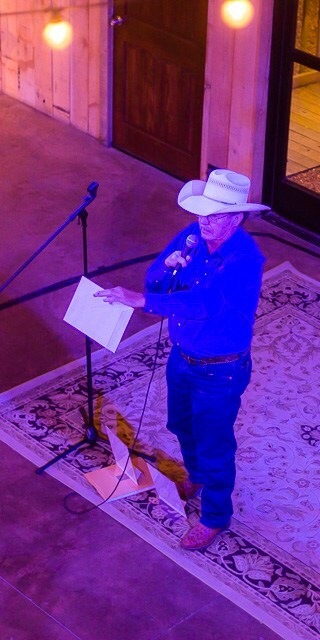 Have you ever heard an old-time auctioneer do their thing? It’s dazzling! Just don’t take a moment to stretch during the auction, or you’re going to ride home the proud owner of whatever they were selling at that particular moment. 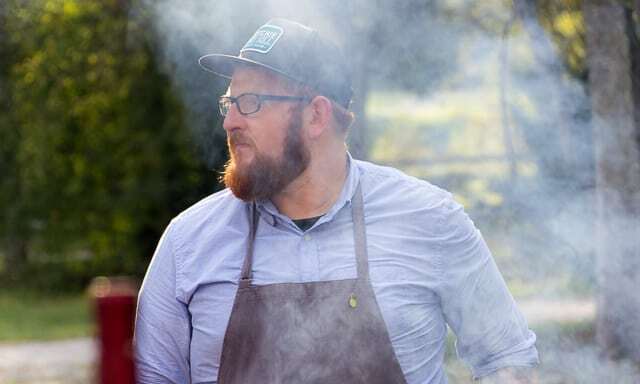 I’d like to thank the BEEFoundation for inviting me to be a part of their very special evening, and I’m excited about the money that was raised to help educate future farmers, as well as our hard-working farmers of today, and consumers. I LOVE FARM FAMILIES, and anything I can do to support and encourage them to keep on keeping on, I’m there! 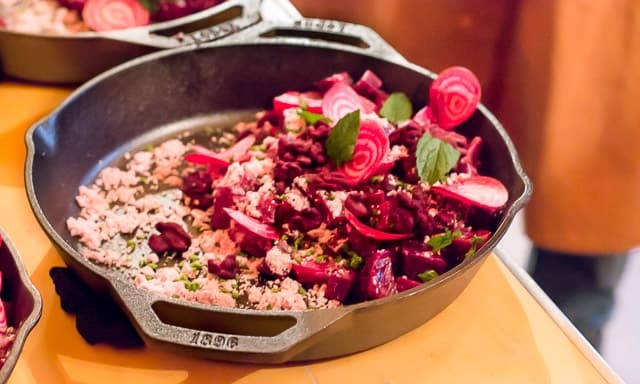 Another special thanks to Lodge Cast Iron®, for their beautiful products, and for partnering with the BEEFoundation! (Here’s just one recipe of mine, where I featured their beautiful enameled cast iron Dutch Oven. What a gorgeous work horse it is! Carnitas Made in my Lodge Enameled Cast Iron Dutch Oven. Pretend like I made the carnitas out of beef, OK?